I happen to agree with Carol Alt and David Wolfe and have been feeding my family a cold pressed dark chocolate for over three years now. We eat the XO healthy chocolate products that use a patented cold pressed method that keeps in the antioxidants of the raw cacao. It is clear there is something to this “Go Cold Pressed” raw option as once you heat or dutch even the highest cacao content dark chocolate, you lose many of the antioxidant benefits. If you want the health benefits of the raw dark chocolate, you will want to make sure you enjoy the cold pressed version. contact us locally in Boca Grande, Punta Gorda or North Port. You can also visit us at the downtown Punta Gorda, Florida farmers market on Saturday mornings. You deserve the best, you deserve cold pressed. I am Lynette Henk, Cold Pressed Chocolate lover. 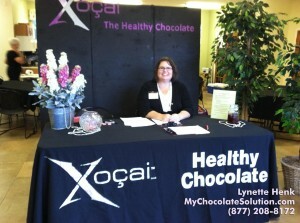 I can be reached at 941-216-5727, at [email protected] or at ColdPressedChocolate.com. NextDid You Know Congress Passed Special Tax Breaks for Small & Home Based Businesses? Healthy Chocolate Taking The World By Storm: Beyond Omega Chocolates Exceed Demand In Centreville, Ontario!